ECE alumni Donald Bitzer, Gene Slottow, and Robert Willson will be inducted into the National Inventors Hall of Fame on May 1 at the United States Patent and Trademark Office (USPTO) headquarters in Alexandria, Virginia. The National Inventors Hall of Fame honors legendary inventors whose innovations and entrepreneurial endeavors have positively impacted society. The induction ceremony is held to formerly induct individuals who invented, patented, and advanced their inventions. Bitzer, Slottow, and Willson are being recognized for their invention of the flat-panel plasma display, the forerunner of high-definition (HD) flat-panel television monitor. ECE alumni Donald Bitzer (BSEE ’55, MSEE ’56, PhD ’60), Gene Slottow (PhD ’64), and Robert Willson (PhD ’66) will be inducted into the National Inventors Hall of Fame on May 1 at the United States Patent and Trademark Office headquarters in Alexandria, Virginia. Bitzer, Slottow, and Willson are being recognized for their invention of the flat-panel plasma display, the forerunner of high-definition (HD) flat-panel television monitor. The National Inventors Hall of Fame honors legendary inventors whose innovations and entrepreneurial endeavors have positively impacted society. The induction ceremony is held to formally induct individuals who invented, patented, and advanced their inventions. Bitzer, Slottow, and Willson invented the plasma display panel in 1964. The plasma panel was originally conceived as an interactive component of Bitzer’s invention, the PLATO (Programmed Logic for Automatic Teaching Operations) educational network. Bitzer holds other patents in the electronics field, including patents for an image selector and an audio device for the PLATO IV terminal. He is a fellow of the American Association for the Advancement of Science, a member of the National Academy of Engineering, a fellow of the Institute for Electrical and Electronic Engineers, and a fellow of the Association for Development of Computer-based Instructional Systems. He received the Laureate of the Lincoln Academy of Illinois in 1982. He retired from Illinois in 1989, and is currently teaching and researching at North Carolina State University. Willson received his BS in engineering physics in 1959 and received his MS in physics in 1961. He then enrolled in a circuit theory course that excited him so much that he switched majors, enrolled in ECE, and began an assistantship at the Coordinated Science Lab, helping Bitzer with the PLATO project. 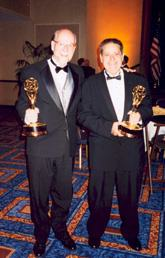 Willson and Bitzer after they received the Scientific and Technological Emmy Award. In 1975, Willson worked as a fellow engineer in the Electro-Optics, Aerospace Division of Westinghouse Electric Corp in Baltimore, Maryland where he co-developed psychophysical thresholds for electro-optic systems. He worked as an advisory engineer in the Systems Development Division at Westinghouse/Northrop Grumman and performed motion compensation, system analysis and synthesis, and developed fast function evaluation techniques. Willson joined SYCOM Services, Inc., a subsidiary of Analex, as an advisory engineer, following his retirement from Northrop Grumman in 1997. He left SYCOM in 2002 and is enjoying retirement in Tahlequah, Oklahoma. Slottow became an associate professor with ECE in 1968. In 1973, he received the Frances Rice Darne Memorial Award from the Society for Information Display for technical achievement, and in 1975 he was elected as a fellow to the Society for Information Display for his outstanding contributions to the advancement of display technology. In 1986, he was elected a fellow of the Institute for Electrical and Electronics Engineers and retired from the university. He passed away March 11, 1989. In recognition of their invention and its significance, Bitzer, Slottow, and Willson’s plasma display panel received the Industrial Research 100 Award in 1966. They received the Scientific and Technological Emmy Award from the National Academy of Television Arts and Sciences in 2002, and were inducted into the Consumer Electronics Hall of Fame in 2006.